For many years, he was the director of Lindenstraße (a very popular TV soap-opera). The number two man of the endless German series - next to Papa Geissendörfer. He directed over a hundred instalments; a new set was just about to be made: one week before the commencement of the shooting. George Moorse died on Friday in Cologne at the age of 63. His love for the long-term project Lindenstraße - here is where the restlessness survived with which George Moorse hurled himself into German cinematic activity in the sixties and seventies. A breathlessness which occasionally seemed unnatural - in its eagerness to expend, squander, even waste. This led him to forget to nourish the art of self-presentation that brought his colleagues Schlöndorff, Herzog, Wenders profile and fame. 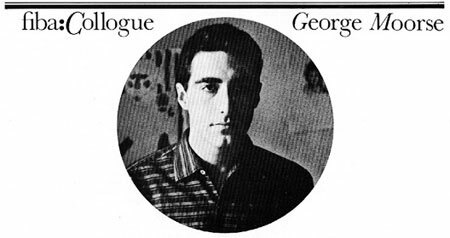 George Moorse was a child of the Beat Generation, whose like he shared in the fifties (he was born on May 1, 1936 in New York) between poetry, painting, and the cinematic underground. He came to Berlin in 1966, invited by the Literary Colloquium; later on, he proceeded to Munich. For his debut, he transformed the beat of German literary outsiders into pictures, filmed Kleist's Foundling in1967 and Büchner's Lenz in 1971. Between these two came Schwabing comedies: Years of the Cuckoo in 1967 and The Griller in 1968. "Corrupted by the addiction to being understood." Indeed, he never coaxed anyone to understand him; above all, he wished to make films, one piece after the other, also for TV - in the experimental studios of the ZDF (the second channel of state-supported German television), in various series of camera films and small TV plays, but also with TV showings of popular culture and theatrical presentations. Bit by bit, a limitless work was put together, characterized by nervousness, in search of a "zero point of creativity" ("Nullpunkt des Schaffens"). Moorse liked to stay spontaneous; his taste for experimenting displaced the compulsion to formulate everything to the last consequence. A work that still has many surprise effects to offer, unexpected cuts and confrontations. A few key words, without a chance of being complete: He studied with George Grosz; he made his first fictional film with Tom Stoppard: Inside Out. He adapted Shakespeare's Tempest and Wedekind's Lulu - the Zadek production (an historic event in contemporary German theatre! ), which he reworked for TV; a film version of Zadek's new Hamlet was being discussed. In between, time and time again, studies of modern alienation., phantom films in the tradition of Val Lewton and H P Lovecraft. His last work, a cinematic essay on the young Goethe on the Brocken (the summit of the Harz mountains, where the witches' sabbath is celebrated in Faust) will be shown by the ZDF (in Germany) at the end of August 1999 as a contribution to the celebration of Goethe's 250th birthday.